While Hall of Fame plaques of Branch Rickey and Pee Wee Reese allude to Jackie Robinson breaking baseball's color barrier, his own doesn't. JACK ROOSEVELT ROBINSON'S Hall of Fame plaque does not mention his race, nor his place in baseball history, nor his place in American history. A big chunk of the inscription deals with Robinson holding the joint record for doubleplays by a second baseman, 137 in 1951.
figure. In 1947, he was. figure in the history of baseball?' "
tender chronicle of Robinson's first season with the Brooklyn Dodgers. He pokes around in the ashes, where most myths start, accepting some, rejecting others. If Robinson's plaque baffles him, angers him, he is not alone. How tough would it be to rewrite the inscription to reflect Robinson's valiant struggle for equality long before Rosa Parks refused to shuffle to the back of a Montgomery, Ala., bus, years before the Supreme Court ruled on Brown v. Board of Education? "There's something to be said for leaving it as is, learning the way things were done 45 years ago, for historical perspective. When it came time for me to write Larry Doby's inscription, there was no way to leave out that he integrated the American League, so it's in there." Branch Rickey's plaque says he "brought Jackie Robinson to Brooklyn in 1947," which is so fuzzy, it's damn-near invisible. 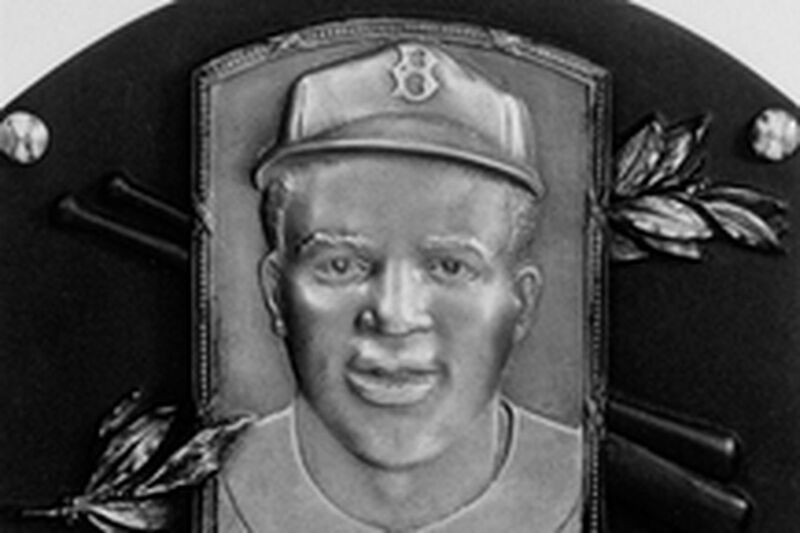 Pee Wee Reese's plaque says the Dodgers shortstop was "instrumental in easing acceptance of Jackie Robinson as baseball's first black performer." That probably puzzles Eig, too. He devotes several pages in his book to digging archaeologically deep to find proof that Reese once walked across the diamond in Cincinnati to wrap his arm around Robinson's shoulders in an effort to silence racist taunts from the Reds and the fans. It supposedly happened on May 13, 1947. "There was a huge black crowd there that day. What I have read is that the white fans were on their best behavior. Robinson later wrote that he was treated nicely in Cincinnati. Reports that it happened came years later. I found it impossible to prove that anything happened that day." columnist who campaigned long and hard for someone to break the color barrier in baseball] was there. He told me he saw it, but didn't write it. to where Robinson was standing and put his arm around him." feeling each other out. I don't think they became friends till much later. And when I talked to Rachel Robinson [Jackie's widow], the one thing she told me is that Jackie had no help that first year, that no one reached out to him." Newsday alumnus, has written a fine new book called "Carrying Jackie's Torch," which describes the painful, bigoted hurdles the next wave of African-American baseball players faced. "Everyone thinks Jackie opened things up, but that isn't the way it was," Jacobson said. And his take on the Reese-embraced-Robinson episode? "Ralph Branca was there," Jacobson says. "He told me it happened, early in the game." "Branca says he pitched that day," Eig counters. "He didn't." Isaacs theorizes that the inscription on Robinson's Hall of Fame plaque "reflects on the lack of social awareness in baseball land in those days." And Jacobson wonders if "maybe Jackie wanted it that way, to let people know that he got in on his baseball skills." "It's what he wanted," Sharon Robinson says firmly. "He wanted to be recognized as an athlete and a baseball player. He did not want to be recognized as a color-bearer. That award is not for a stand on human rights or for any accomplishments beyond the playing field." Inductees get no input into what goes onto the plaque, not even the logo on the cap. "That would be like showing someone the story you're writing in advance," Idelson says. "You'd never get it finished." There is one other way to look at the plaque. Of those record 137 doubleplays, how many of them came with Robinson as the pivot man, desperately dodging a baserunner's thrashing spikes aimed at his ankles, his knees, his belt buckle? Think about it, and you come away with an appreciation of what Robinson faced in a 10-year career, from aloof teammates, from red-necked opponents, from prejudiced fans, the Dodgers winning six pennants in that span.